Codeigniter Application Installer is an eloquent module that makes your codeigniter application installation so easy as breeze. It makes the necessary changes of your config/config, config/database & config/email files, database upload – all things in a single click. 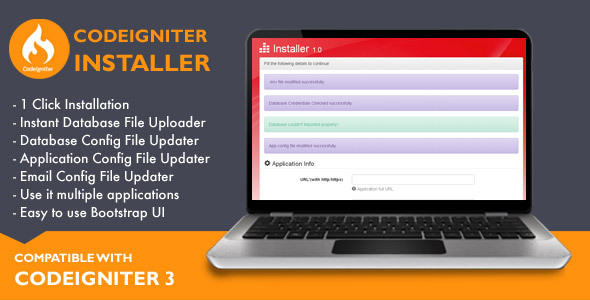 You can use this installation for all of your codeigniter applications, particularly for your selling applications with this easy installer. Just extract the source code in your Codeigniter Parent folder and Run the Installer!